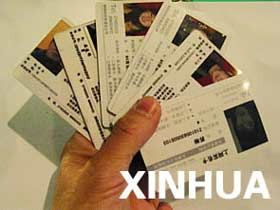 In most legal Internet Cafes in mainland China, one has to provide his / her "real name card" when he / she hopes to login on a computer and surf the line. The name, resident ID number and other information are integreted in these cards and they are granted by some goverment angencies. The government officers seem believe these cards can prevent the breach of the law when internet users surfing the line. I can't imagine how this regulation can be implemented since the cost of implementation is so high that no goverment agencies are capable to check whether the users are really using their own "real name cards". The old Chinese saying tells us that stopping up the speaking is more difficult than blocking up the river. Actually, before using the "real name card", one has to provide his / her Resident ID Card in the Internet Cafes. I can't understand the distinct between these two cards in controling the acts of the internet users. So even we ignore questioning the legitimacy of controling speaking, what is the reasonable argument for this redundant regulation can still be problematic. Also, the old Chinese saying remindes us "it is stupid to sell water to fisherman". The regulation of using Real Name Card will only be benifit to the manufacturer of Real Name Cards. I dare not and have no evidence to suspect the relationship between manufacturers and the goverment agencies. However, it is of cause will increase the possibility of corruption. And, to prevent this corruption, extra cost will be paid definitely. Are the bills really be printed without the contribution of tax payers?